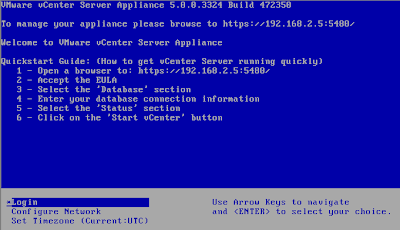 - and you have existing Linux administrators who can look after it; then the new VMware vCenter Server Appliance (VMware VCSA) is well worth a look. 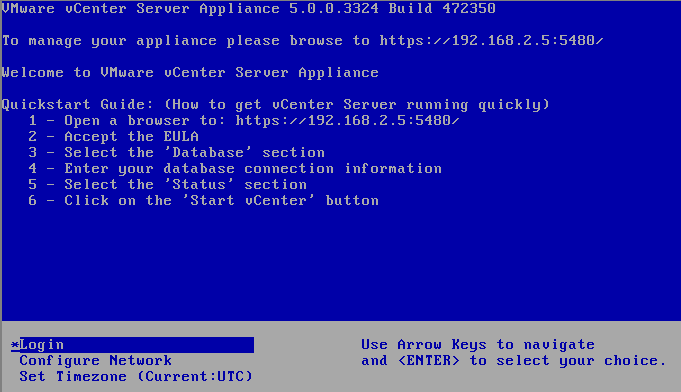 After reboot the vCenter Server Appliance is ready to connect to via the vSphere client and configure as normal. Note 1) In practice, it would be possible to create a pre-built Windows VMware Virtual Center Appliance and deploy this at customer sites to get similar benefits to the quick and easy setup of VMware's SLES 11 VC Appliance. "the embedded database. This option is available only for a small inventory size, with fewer than 100 hosts and 1000 virtual machines." "The embedded database is not configured to manage an inventory that contains more than 5 hosts and 50 virtual machines. If you use the embedded database with the vCenter Server Appliance, exceeding these limits can cause numerous problems, including causing vCenter Server to stop responding." I have seen in VMWare's documentation that the embedded database can support up to 100 hosts and 1000 vms (http://pubs.vmware.com/vsphere-50/index.jsp?topic=/com.vmware.vsphere.vcenterhost.doc_50/GUID-0B9988FF-5FB6-4656-9C58-EE3617B57E90.html). Can you tell me where have you seen the 5 hosts and 50 vms limit? (Just to contrast official vmware infos). - I will update with the correct information. Just to confuse anyone a little bit more, there's a note from VMWare saying the maximum allowed is 5 hosts and 50 VMs: http://kb.vmware.com/selfservice/microsites/microsite.do?cmd=displayKC&docType=kc&externalId=2006816&sliceId=1&docTypeID=DT_KB_1_1. I've asked for a clarification from their part. However, now I'm wondering how ESXi 5.0 will work with FreeNAS NFS or iSCSI multipatched.. The reference to the vCenter Server Appliance supporting up to 5 Hosts and 50 VMs for the Embedded Database max support is from the vSphere 5 Documentation "vsphere-esxi-vcenter-server-50-installation-setup-guide.pdf" page 203. Thanks for the update. I originally had it as 5 host and 50 VMs, then the documentation said 100 hosts and 1000 VMs, and now back to 5 hosts and 50 VMs again. Post updated accordingly. Did You sucessfully started embedded database for this? I can't. Webpanel hangs after selecting "embedded". Now you come to mention it, I did get the hanging Webpanel too, this was when I was first testing and had dropped the memory down to 4GB RAM. When put it back to 8GB RAM, then it ran fine for me. agreed,since it is stated that it would need higher amount of ram (double the min requirement) if it is embedded. But you guys mentioned what happened here,so i took note of this.thanks!